Reservoir's replacement role that started 155 years ago Silsden’s picturesque reservoir performs today the same role for which it was built in the late 1850s. Pictured above is Yorkshire Water resource engineer Dave Driver, who in effect is the reservoir keeper. He and his team of seven engineers maintain the reservoir and the local dams and water-supply networks. The Silsden compensation reservoir, situated between Great Gill Beck and Fish Beck, holds 550,000 cubic metres of water (about 120 million gallons) from a catchment area of 7.85 kilometres square (3 miles square). At its maximum, it is 24 metres (78 feet) deep. The reservoir’s purpose is to replace water that is taken from rivers and streams elsewhere to supply domestic drinking water. Commissioned 155 years ago, the reservoir was part of a major expansion by the new Bradford Corporation to supply clean water to the fast-growing city. Silsden's job originally was to compensate mill owners on the River Aire for the loss of tributaries, which powered their machinery. The reservoir was formed by damming a deep ravine. The dam has a clay core within an earth embankment 34 metres (111 feet) high. The picture above shows the crest of the dam, which is the original construction. Known as a Pennine dam, it was cutting-edge engineering in Victorian times. All of Yorkshire Water’s dams are inspected three times a week. Above: engineer Dave Driver in the draw-off (or valve) tower. The reservoir is a landmark feature familiar to all travellers on the A6034 road at Cringles. Silsdeners feared for their lives and homes with a reservoir being built above their village. The early years of the reservoir are described in a Silsden Local History Group paper by David Mason, based largely on research by Brian Sunderland. A plaque marking the opening in 1974 of the treatment plant at Silsden reservoir, which had always been a Bradford Corporation facility. Yorkshire Water took over later in 1974 when regional water authorities came into being. The treatment plant closed about 15 years ago. The 28-acre reservoir site previously had been home to a mill manufacturing quality high-backed chairs, washing dollies and hayrakes. The mill, owned by the Laycock family of Fishbeck Cottage, closed and was submerged when the reservoir was built. The ruins of the mill and the outline of the mill pond were revealed when the reservoir dried up in a severe drought in 1959.The photograph above is believed to show the empty reservoir at that time. Silsdeners flocked to see the mill ruins. Four men and their boats. These would-be sailors are pictured at the reservoir probably in the 1930s. Sailing model yachts was a popular pastime in the days when parks had boating ponds. Second from right is Oswald (Ozzy) Firth, a larger than life Silsden character, who ran a pies, peas and tripe shop in Kirkgate in the first half of the 20th century. Fishing rights at the reservoir for years have belonged to the Bradford Waltonians Angling Club. 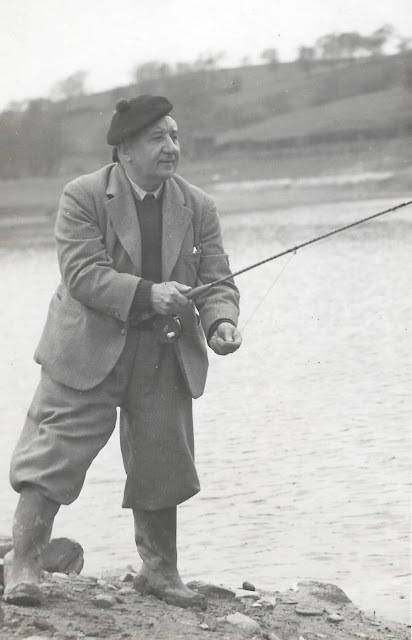 This photograph taken in 1941 shows Scottish music-hall star Will Fyffe fishing at the reservoir on a day off from an engagement in Huddersfield. Will wrote the famous song "I Belong to Glasgow." Above: William Lambert, who died in 1944 aged 83, was one of the best known local anglers and had fished at the reservoir with Harry Lauder, Will Fyffe and several other celebrities. Mr Lambert, who travelled thousands of miles to fish in contests, is pictured with some of the numerous angling trophies and medals he won. He was a member of Silsden Urban Council and chairman of the Fire Brigade Committee.